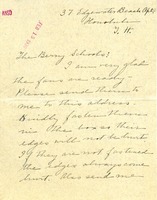 This letter is written from The Berry Schools to Mrs. Milton to assure her that her letter for her fan order was received. The Berry Schools enclose a receipt for three white turkey fans and request Milton's permanent address. 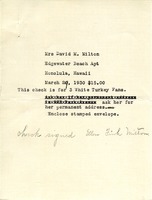 Note for sending a receipt to Ellen Fink Milton for her purchase of three white turkey fans. 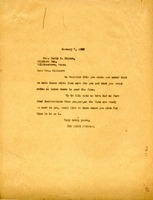 This is a letter written to The Berry Schools requesting fans. 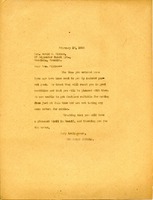 Mrs. Milton is requesting that the fans that are ready are sent to her. She also asks for a turkey tail fan to be sent. She requests that the fans are fasten to the box so that the edges are not hurt. 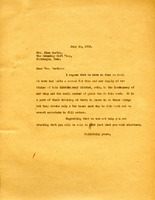 This is a letter from Berry Schools to Mrs. Milton, inquiring where to send three fans made for Mrs. Milton. 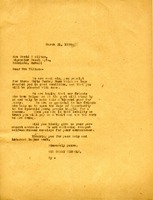 Letter to Elma Martin from Martha Berry informing her that they have no fans at their disposal. 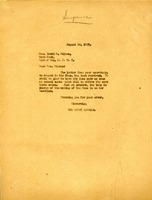 She informs Mrs. Martin that the girls only devote a few hours of the day to making such things and do not have the ability to undertake such orders to keep up with demand. She does wish her well in finding what she wants elsewhere.